This appendix shall explain and analyze some blackjack side bets I have seen. In the U.S. a W2G tax form is generated on any table game win that exceeds $600 and pays 300 to 1 or more. Information on this side bet has been moved to my page on 21+3. This is a side bet found in the game Buffalo Blackjack. The outcome of the 21 Magic bet is so dependent on player strategy that I analyzed it in connection with the blackjack wager. Please see my Buffalo Blackjack page for more information. Please see my page on Bet the Bust for more information on this side bet. Please see my page on Block Bonus for more information on this side bet. Please see my page on Blackjack Match for more information on this side bet. Please see my page on Blazing 7's. Please see my page on Block Pro Blackjack. I have seen four different blackjack side bets called "Bonus Blackjack" through the years. For an analysis of all of them, please see my Bonus Blackjack page. This is a progressive side bet based on three cards and marketed by Galaxy Gaming. For all the details and analysis, please see my Bonus Jackpot page. This a simple side bet that pays 5 to 2 if the dealer busts. I've seen it at various casinos in Europe. For more information, please see my page on the bust bet. Please see my page on Bust Bonus for more information on this side bet. This side bet wins when the dealer busts. The more cards it takes, the more it pays. For more information, see my page on Buster Blackjack. Please see my page on C3 for more information on this side bet. Copy Cat is a side bet based on matching the player's initial two cards to the dealer's up card in rank, and sometimes the hole card as well. See my Copy Cat page for all the details. Crazy Sevens is the same thing as Super Sevens but with a different pay table. Both are addressed in my Super Sevens page. Dead Man's Hand is a side bet based on getting aces and eights. See my Dead Man's Hand page for all the details. Information about this game/side bet can be found in my Extra Bet Blackjack page. This bet may also be known by the simple name the "In." Please see my page on In BETween for more information on this side bet. 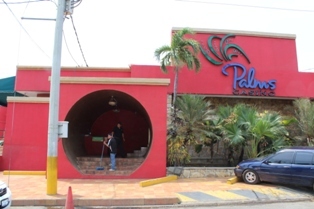 After going 13 years without seeing the Streak bet I suddenly saw it, under another name, at the Palms casino in Managua, Nicaragua, on April 29, 2013. There it is called the Fuego bet, which means fire. They use a different pay table, as shown in the following pay table. For splitting, they use the first hand played out for purposes of the Streak bet. Otherwise, the rules are a little different, but still use six decks and the dealer stands on a soft 17. To simplify the analysis, I'm going to assume the same 47.51% of a net win as I do under the Atlantic City rules. This side bet, used by Evolution Gaming, is similar to the Lucky Lucky. Information about it can be found in my Hot 3 page. Please see my page on Lucky Ladies for more information on this side bet. Information on this side bet has been moved to my page on the Lucky Lucky. Next Step Blackjack features a side bet that wins on a player or dealer blackjack. For player blackjacks, the win depends on the shake of four dice. See my Next Step Blackjack page for all the details. Please see my page on Pair 'Em Up for more information on this side bet. Please see my page on Perfect 11's for more information on this side bet. I have seen side bets on any player blackjack, a colored player blackjack, and a suited player blackjack. For the analysis of all of them, please see my page on a Player Blackjack in First Two Cards. Information on this side bet can be found in my Raise the Roof page. Information on this side bet can be found in my Royal 20's page. Please see my page on Spread-Bet Blackjack for more information on these side bets. Please see my page on Super 4. Information about this bet has been moved to my page on Super Sevens. Please see my page on Royal Match. Suit 'Em Up blackjack is like the Royal Match in that it pays if the player's first two cards are suited. Wins depend on what the ranks are. See my Suit 'Em Up page for all the details. Streak is an optional blackjack side bet I noticed at Caesars in Atlantic City in April of 2000. Since that time I have seen it displayed at the Global Gaming Expo, where I have been given rule updates. Streak is a simple bet on winning a specified number of consecutive bets. If the player splits then it is the net win that counts toward whether the hand as a whole won or lost. For example if the player split and won one hand and pushed the other the hand would count as a net win. In the event of a push or breaking even after a split the hand would not count for purposes of the side bet, neither advancing the number of consecutive wins nor breaking the winning streak. The player may bet on a winning streak from 2 to 5, or as many of these as desired. My blackjack appendix 4 addresses the probability of a net win or loss. However that table includes surrender, which is usually not offered, and a player may decline to take anyway, if a Streak bet were on the line. So I reran my simulation with the following rules: six decks, dealer stands on soft 17, no surrender, player may split up to four hands, double on any two cards, double after split allowed, resplit aces not allowed, cut card used. Here are the results of the simulation. The lower right cell shows a house edge of 0.4521%. This may look a bit high for the rules, especially against my blackjack calculator. Most house edge figures, including those of my calculator are based on a continuously shuffled game. The use of a cut card, as was the case in this simulation, adds 0.02% to the house edge with six decks. For more information on the cut card effect please see my blackjack appendix 10. Adding up the wins and losses we get the following. The probability of winning n hands in a row is simply 0.4751n. The following return tables show the pay table, probability of winning, and return for all four streak bets, under both the new and old rules. The table above shows that under the new, more liberal, rules the best bet is on a streak of 4, with a house edge of 3.20%. This pair of side bets pay even money if the player can correctly bet if the sum of the player's first two cards will be over or under 13. Aces count as 1. At the Majestic Casino in Panama City, Panama, the player may also bet on exactly 13, which pays 10 to 1. The following is the house edge according to the number of decks. The house edge for exactly 13 is calculated at 10 to 1. "Pair Square," which also goes by the name "Bet the Set" and "Any Pair," is one of the most successful blackjack side bets. It wins if the player's first two cards are a pair, usually more for a suited pair. I have seen or heard of a number of pay tables through the years. Following are return tables for some of them. The following 25-8 pay table is used by Evolution Gaming, calling it the "Any Pair." They use eight decks of cards. The lower right cell shows a house edge of 4.10%. The next table summarizes the house edge for all known pay tables, except the 25-8 one, by number of decks. A negative house edge denotes a player advantage, for a combination of pay table and number of decks you're unlikely to ever see, but let me know if you do. Pair Play is a simple side bet by Pala Interactive that pays 11 to 1 if the player's first two cards form a pair. It is mathematically the same as the two pair bets in baccarat. The next table shows the house edge only for various numbers of decks. I noticed this variation of Bet the Set on April 19, 2013 at the Red Rock casino in Las Vegas. It was dealt from a six-deck game. The bet wins if the player has a pair for his initial two cards, more if they are suited. Unlike the normal Bet the Set, if the player has a pair he has a chance for big wins if the dealer also has a pair of the same rank. If the player gets a colored four of a kind not only is he paid 250 to 1, but also wins a progressive jackpot. In addition, there are envy bonuses if another player gets a colored four of a kind. The minimum bet to qualify for the jackpot and envy bonuses is $1. Rack card. Click on either image for a larger version. The following table shows the odds for a six-deck game, before considering the jackpot and envy bonuses. The lower right cell shows a house edge of 27.74%. For a $1 bet, every $1,000 in the jackpot meter increases the expected return by 0.033232. If the player bets more than $1, then divide that increase by the amount bet. For a $1 bet, every other player at the table (not counting yourself) increases the expected return by 0.001662. If the player bets more than $1, then divide that increase by the amount bet. For a $1 bettor, the jackpot break-even point is $8,347.58, less $50 for every additional player at the table. When I saw this bet on April 20, 2013 the meter was at $7,817.44. When I first saw this bet years ago at Caesars Palace it was just called the "tie." Years later I saw the thing under the name "Push Your Luck" at the Palace Station. Winning blackjack pays 3 to 2. The following table shows the proper basic strategy assuming the maximum side bet is played and the rules above. Assuming the rules and strategy above, I show an overall house edge of 0.24%, which is the expected player win divided by the initial 1.5 units bet. If a winning blackjack paid 6-5, then the house edge would be 1.15%. Blackjack pays 6 to 5. If player doubles, he does not double the tie wagers. If player splits, he does not double the tie wagers. Any tie wagers will be resolved based on the first hand played out. An ace and 10 after splitting aces is considered 21 points for purposes of both the blackjack and tie wagers. If the player re-splits, then all tie wagers are lost. The layout has betting circles for 17, 18, 19, and LS (left side) tie wagers on the left of the betting circle for the blackjack wagers. The other four tie wagers are on the right side. The player may bet up to half his blackjack wager on the sum of the four left side tie wagers, and likewise up to half on on the right side. If the player does bet a tie, it significantly changes the strategy. The player will do more hitting, and less of everything else. There is a separate strategy for each tie wager. I won't bother to publish them unless the game gets a significant number of placements. I spent all day trying to analyze this one, but the doubling and splitting rules made it too difficult. So I'm quoting below pay table #4 from the game owner's web site, blackjacktie.com, with permission. Sweet Sixteen is a blackjack side bet I noticed at the Las Vegas Club in April 2001. It is played with a six-deck shoe and pays based on the player's first two cards. The following table shows each paying hand, the probability, payoff, and contribution to the total return. The lower right cell shows a return of 97.43%, for ahouse edge of 2.57%. Here is the house edge for other numbers of decks. Dare any Pair is a side bet I noticed at the Lady Luck in April 2001. It simply pays 11 to 1 if the player's first two cards are a pair. Six decks are used. The probability of a pair is 0.073954984 for a house edge of 11.25%. Here is the house edge for other numbers of decks. As the name implies, this is a blackjack side bet with a progressive jackpot. For an optional $1, the blackjack player may win $3 to the progressive jackpot, which starts at $25,000. I saw this side bet at the New York New York casino, where they had three tables tied into the same progressive. On July 30, 2001, the jackpot meter was at $35,537.36. At this time, I was told they recently put it in place and nobody had hit the jackpot yet. On August 11 the meter had risen to $37,746.28. Just like in Caribbean Stud, the player puts the $1 for the Progressive side bet in a slot. Before dealing a new hand, the dealer presses a button, the dollars vanish, and a light designates who made the bet. The following table shows what each winning hand pays, the probability (based on the dealer peeking for blackjack), and the contribution to the return. The following table shows the return based on a meter of $35,537.36, the amount the last time I observed it. The above table shows an expected return of 56.10% per dollar bet, or a house edge of 43.90%. The general formula for the return is 47.01%, plus 2.56% for each $10,000 in the meter. To have no house edge, the meter would need to reach $207,287.85. Also note there are no basic strategy deviations for this side bet. If the player gets two aces, then he should split anyway, which guarantees two more cards. It is unclear to me what events cause the meter to go up and down. Sometimes the meter goes up by 28 cents for each $1 bet made. According to the Mikohn's web site, the house edge is 22%. If this is the case, then the meter contribution rate is 24.60%. Mikohn also mentions that part of each dollar goes to a higher reseed of the next jackpot. So 24.60% would be divided between the current meter and the next one. Based on this contribution rate, the average jackpot when won would be $121,225.86. Here is another version that has been seen at Internet casinos using Cryptologic software. The game uses eight decks of cards. Four suited aces	 Jackpot	 6720	 0.00000023	 ? Total	 29518332480	 1.00000000	 0.403142 + ? Based on a $1 bet, this bet becomes break-even at $2,621,763.29. The general formula for the return is 0.403142 + jackpot/4,392,609. Twin blackjack is not a side bet, but a variation of the game of blackjack. I saw the game at the Stardust in August, 2001. Each position has two betting spots. If the player makes a bet in both of them he will play out two hands against the dealer's up card. In the event the player gets two blackjacks (called twin blackjacks) they both shall pay 2-1. If the player gets two identical blackjacks (called identical twin blackjacks) both shall pay 4-1. The following table shows what this is worth to the player. The lower right cell in the table shows the twin blackjack rules add about 0.1133% to the players return. However, as usual with novelty games, you give more than you get back. In this case, the player may NOT double after a split and the number of splits per hand is lowered from 3 to 2. Under the normal Stardust 6-deck rules the house edge is 0.4066%. Under these rules, not including the twin blackjack bonuses, the house edge is 0.5527%. Overall the house edge is 0.4394%, 0.0328% higher than the conventional rules. There are two side bets calling themselves Perfect Pair and Perfect Pairs. Both are addressed in my page on Perfect Pairs. Bonanza Blackjack is a side bet found on a fully-electronic 6-deck game at the Boulder Station in Las Vegas. If the player has any 20 (including a soft 20) and the dealer has a 10-point card, then the player will win something. This is a $1 side bet, no more and no less. The lower right cell shows a house edge of 18.19%. This is a simple pair of side bets I noticed at the Casablanca in Mesquite, Nevada. The player simply bets if his first card will be higher or lower than the dealer's up card. In the event the two cards are the same rank, except aces, the tie shall go to the dealer. Two aces push. The game I saw it on was 6-decks but here is the house edge for all numbers of decks. At BetVictor six decks are used. The following table summarizes the probability of each outcome. Here is the house edge only according to the number of decks. Wild Aces is a simple side bet the player may make if his first card is an ace that his next card is any 10-point card. Wins pay 2 to 1. Mathematically, it is the same as insurance. The following table shows the probability of winning and expected return by number of decks. As of May, 2018, it can be found at the Westgate in Las Vegas. Some readers may be interested to know the maximum bet on Wild Aces is $100. I think you can count on that. Information about this bet can be found on my page on the Zurich Progressive.